I bake a lot of “Asian-inspired” cakes and bread at home, largely because these are the kind of confections I grew up eating from our local neighbourhood cake shops. Pandan Chiffon remains top on my list and I bake it ever so often for friends and neighbours. Then there are the “coconut” and “otak” buns, sweet dough breads filled with local flavours in both sweet and savory. 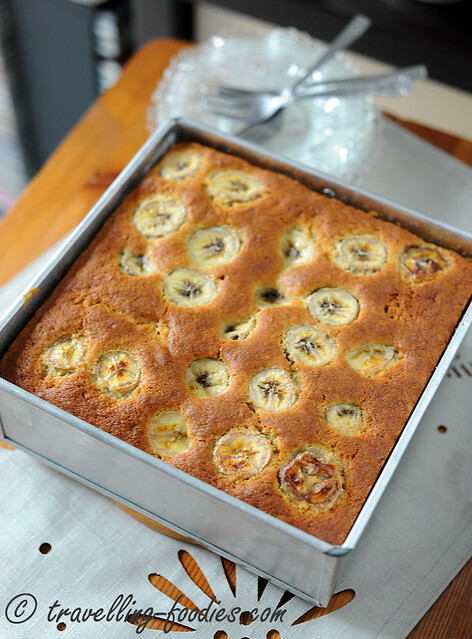 And of course there is the good old banana cake, requiring few ingredients but so yummy and fragrant. 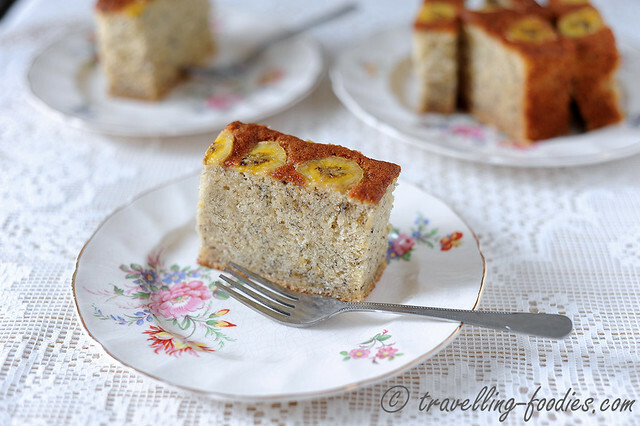 I’d been using a banana cake recipe for over the last 3 years now and repeatedly use it whenever we have over ripened bananas at home which are beyond their prime to be eaten, or simply whenever I have a craving for banana cake. It remains on my “regular to bake” list as the cake is very soft and fluffy and everyone loves it. The results are so consistent and reproducible, given that one follows the recipe and observes the important details well. 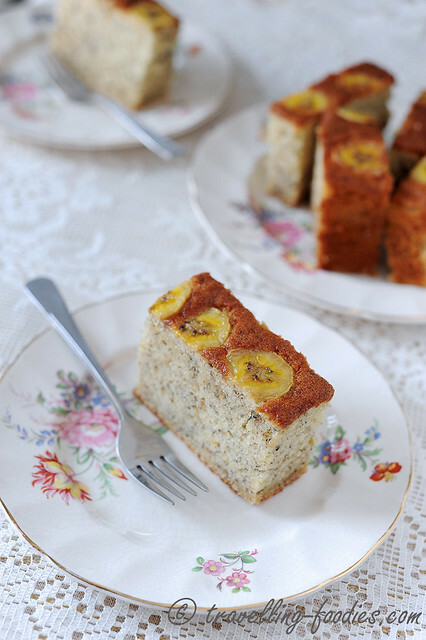 Otherwise, this banana cake recipe is definitely a keeper and I strongly encourage those who’d not tried it to have a go! This recipe was shared by a fellow blogger friend Wendy Han who in turn learned it from Richard Goh, a popular baking instructor who conducts classes at neighbourhood community centres. Several of my friends had taken up baking classes with him before. Perhaps I should too, to hone my rusty baking skills! The ingredients list is very short and so are the instructions. One thing important is to go for bananas which are over ripe. Just when you think that their yellow skin has turned brown and punctated with spots which make them much less delectable to eat, over riped bananas are so so aromatic. They go all soft as the starch in them gets slowly broken down into sugars causing them to be so so uber sweet, that make them perfect to be baked in cakes! Cake flour is also crucial here as it is the low gluten level in the flour that gives them a soft crumbly texture. Low gluten levels in the flour also make the batter more forgiving during mixing, yielding softer and fluffy cakes. So use cake flour for this recipe whenever possible and not plain/all-purpose flour. Laying sliced bananas over the top is entirely optional. I love the idea as it adds on a personal touch to the bake, don’t you think? Feel free to omit though as I know some who prefer their cakes to look plain as afterall, what is important is the taste and not so much to how it looks. As one can see, when properly baked, the cake should rise beautifully, almost doubling in height. Watch the oven settings and the cake would bake uniformly without the top cracking whatsoever. It should also brown beautifully on the top surface from the maillarding sugars in the batter. 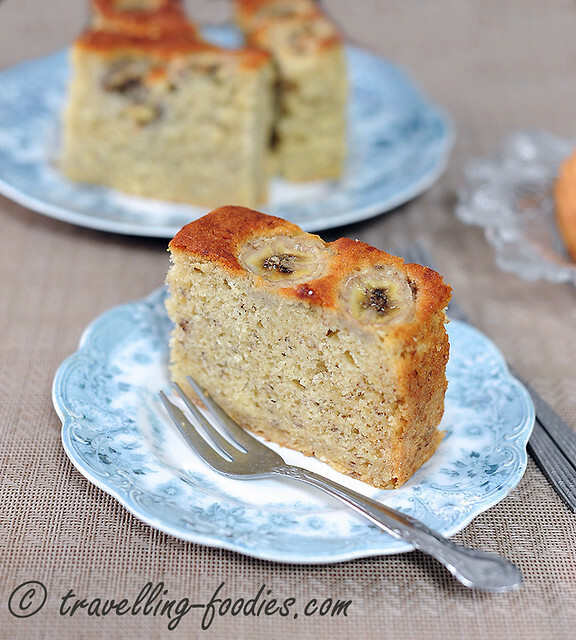 Here’s a slice of banana cake made with the same recipe a couple of months ago. The crumbs are soft and moist to produce a really fluffy cake but as the whole egg method is used, the textures would be less fine compared to a cake produced by the egg separation/chiffon method. The whole egg method on the otherhand is more direct and fuss-free. The challenging part of this recipe is in the attainment of the ribbon stage for the batter. It takes quite a bit of patience to get there, especially with a handmixer which posed the risks of overheating the machine as the batter needs to be whisk continuously for at least 13 min or so until it reaches the “ribbon stage”. This is when the batter would flow down continuously back into the bowl when the whisk is lifted from it, without breaking into drips and drops. The continual streams of cascading batter would flop and overlap over each other when they reach the bowl creating the “ribbon-like” effect which lends this technique its name. This can be quite nerve-wrecking for those who are trying the recipe for the first time but just persevere on until the correct batter consistency is obtained. Unlike the egg separation method which requires a meringue to be whipped separately on its own, the direct method using whole eggs is much much more forgiving as there is little risk of overwhipping the batter, unlike the meringue which would disintegrate and become watery when it is whipped beyond stiff peaks. So on the whole, this is a very easy cake recipe to follow. This entry was posted on October 25, 2014 by Alan (travellingfoodies). 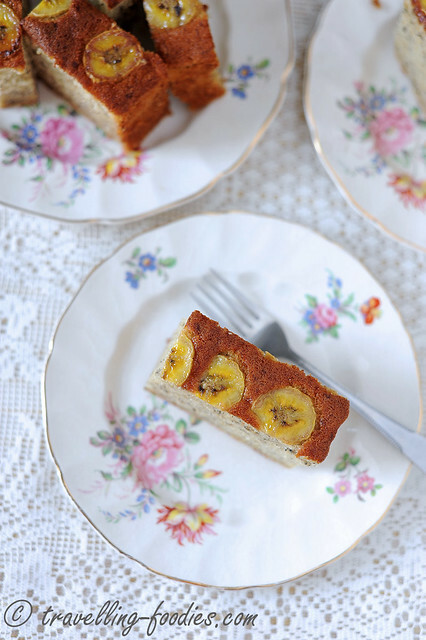 It was filed under Food, Simple Eats and was tagged with banana cake, cavendish bananas, pisang berangan, pisang rajah, ribbon stage, richard goh, vanilla. Alan, your baking / cooking definitely far away from rusty….. Son who don’t like nanas cake goes WOW….. When I show him this page and I’m happy to spot NO milk used here as I can’t stomache it at all…… So no balloon whisk?? Which attachment then? The flat one that we use for BUTTERCAKE? I will delay this bake as no nanas plus I can’t bake it that huge since I’m not suppose to eat….. Sian…… Imagine I can only take a slice….. Out if this 10 inches! Hi Alan! Did you use fan-forced mode when baking? Would you advise to bake on the middle or bottom rack? Thanks! yup i used the fan force mode and the lowest rack for baking. Your cake looks soft and yet firm. Mine is crumbly, what could be the reason? Tried this recipe. It is nice and my families member said it is delicious. Thanks for sharing. Btw, I have difficulties in folding in the flour into the batter when using spatula. I find it very difficult to mix well. There are still lot of flour after mixing quite some time. Can I use machine K beater to mix the flour? Hi Josephine, thanks for writing. You are right about the batter being challenging to fold during the final stages with the incorporation of the flour. I wouldn’t advise on using the k beater though, as there may be a tendency to overbeat the batter and work up too much gluten, causing the final cake to taste tough and chewy. Instead of using a spatula, you can also use your hands to fold the flour into the batter. Otherwise, you can try to remove a small amount of wet ingredients mixture, say 15% of the total amount, and mix well with the dry ingredients mixture to form a thick paste before folding it back into the remaining wet ingredients mixture. The latter is what we do in folding chiffon batters. I used K beater for a while to mix in the flour. You are right!!! The texture is a bit tough and chewy but overall the taste is still nice. I am looking for soft and spongy kind of texture. I believe the folding part is to maintain the airy in the batter and to make the texture soft like chiffon cake. Alright. I will try again next time. I have baked this today. Other than the difficulty in the flour folding, the other problem I encountered was mixing in the oil. I got lumps of oil in my batter when I poured it into the baking tin. I ended up mixing the lumps of oil with the batter in the baking tin. 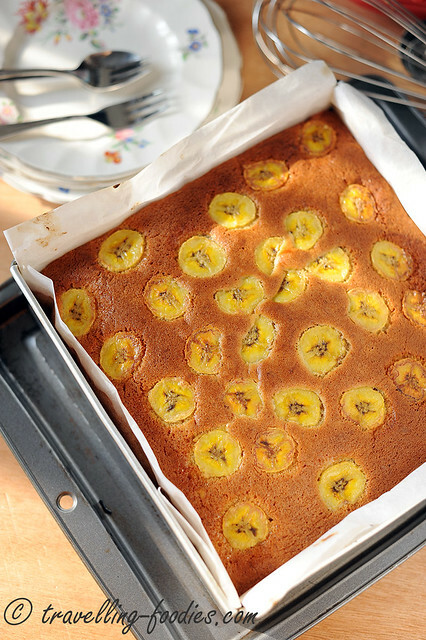 The end result of the banana cake is still soft and fluffy. But it did not rise much. I wonder if it is because of the over mixing of oil. Could I check what is the ideal way to mix in the oil? thanks for sharing the recipe. 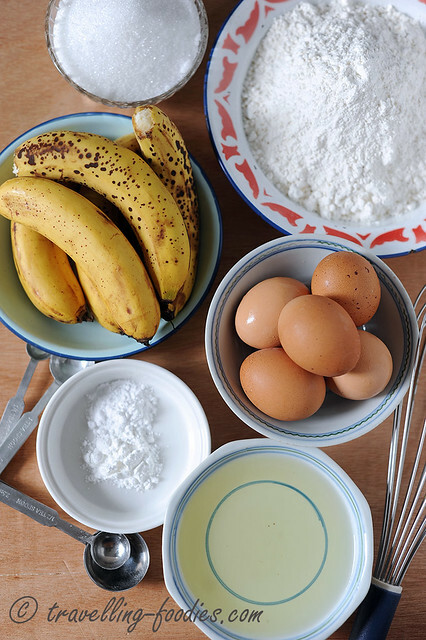 I followed it to the T, and whisked the banana+eggs+sugar for about 12 min and the batter more than tripled. I had no space in the mixing bowl to fold the flour! Is it supposed to increase so much? The cake was baked for 40 minutes and it rose very nicely in the oven, with no cracks. However, once it was removed from the oven, it starts to sink. I also noticed that the base of the cake is more dense and moist. Despite the cake sinking and having a dense bottom, it tastes good. I am very keen to try the recipe again, and greatly appreciate you can advise what I have done wrong / not done, so I can improve on the next bake.